A big thank you as always to Mike, for letting me share my thoughts on the latest 1/6th releases, and this time I REALLY mean the latest! I generally like to take my time with reviews… to live with the figure for a while and get to know its true strengths and weaknesses, but on this occasion speed was very much of the essence. 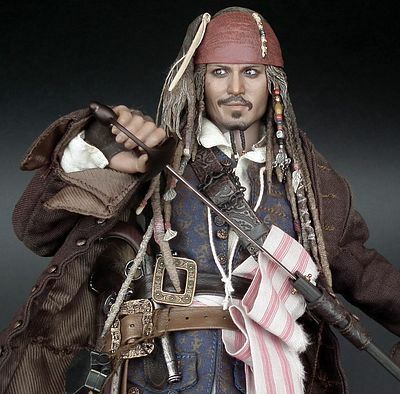 I received a ‘cloak and dagger’ email last week asking if I would be interested in getting an early preview of the Jack Sparrow DX 06 figure and getting a quick review ready for a specific date. Knowing time was tight, I was told a pictorial review would suffice at this stage… but what’s a true review without some thoughts and critique… EXACTLY! And so it is that after a couple of virtually sleepless nights (I do have a busy day job you know) that I managed to pull this together! And what have we got, well it’s probably just about the best DX so far, and yes I do have them all, so yes I know what I’m talking about and I am also fully aware that that is no mean feat! I loved the first release of the DX Joker, as a mass produced figure it was and is virtually perfect, and the heavy ‘panda’ make-up helped the Parallel Eyeball Rolling System (PERS) feature look pretty darned convincing. It’s a feature that has worked to varying degrees of success on the subsequent releases, and it works exceptionally well again here. You see Cap’n Jack has a tendency to like heavy kohl around his eyes; this of course works for him on many different levels as a character. 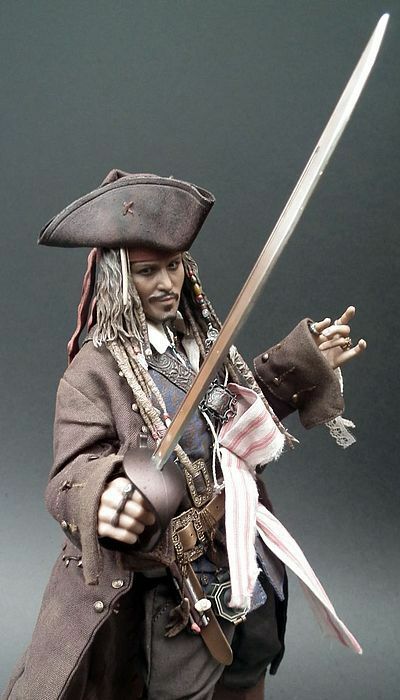 Primarily it makes him look exotic and ‘other’ from the rest of his scurvy crew of reprobates, but it also gives him a slightly fey edge and a very rock ‘n’ roll air. 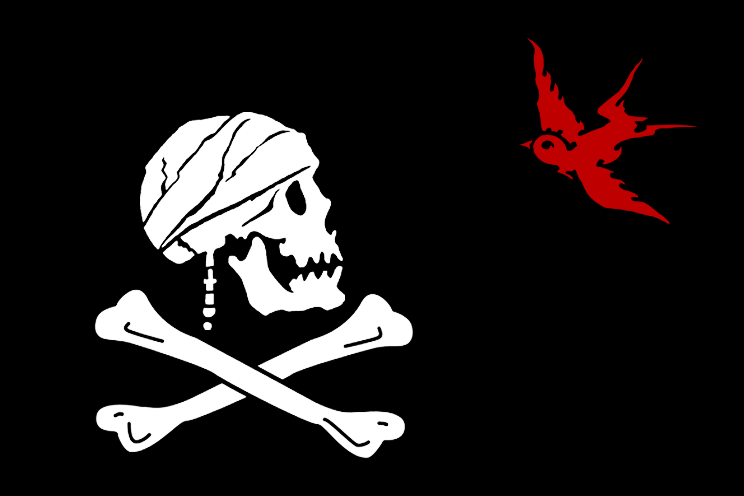 These attributes translate across Jack’s whole being, his sensibilities are narcissistic to say the least, and even though it is set during the golden age of Caribbean piracy (circa 1650 to 1680) it makes him just about the most perfect ‘contemporary’ anti-hero for our troubled times. The only real problem being that as memorable as the character is, the movies he appears in aren’t quite so strong! Like most, I was caught off guard by the original movie, after all if it’s so hard to make a decent film about a computer game, what chance did they stand with a whole franchise based on a theme park ride! 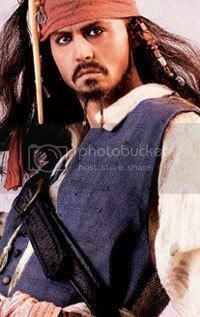 Well, as it happens, it turned out they had a better chance than anyone expected, and The Curse of the Black Pearl (2003) was an instant summer blockbuster. Its huge money making popularity lead to two rather messy, but overall entertaining, sequels that were shot back to back and released a year apart in 2006 and 2007 respectively. But when you have a cash cow this big, you just gotta go back and milk it some more. On Stranger Tides was released earlier this year (2011) to very mixed reviews, however, it still made over $900 million worldwide and stands as Disney’s third biggest earner (if you include Pixar’s Toy Story), and the eighth highest grossing movie of all time. With that kind of popularity it was of course decided to continue with the franchise. I have to admit the selection of Rob Marshall as director struck me as just about the oddest of choices. He did a fair job with the material he was given, it did however lack flair, and quite frankly was just plain dull for long stretches. But looking at his back catalogue, what could we expect? Of course it’s not the first time we’ve had Hot Toys cast their eye over this guy, first we had the classic Jack from ‘At World’s End’ which I covered here that was soon followed by the even better cannibal king version which I also reviewed here. All three of the included portraits were the work of the ever-reliable Yulli Choi, but this time around we get one of Hot Toys other master sculptors Ko Jun throwing his leather tri-cornered hat into the ring, with not one but two unique facial expressions. However, for those that don’t know he is also no stranger to this particular salty sea-dog, as he also released his very own version of the corsair a few years back as an extremely limited ‘pop-art’ piece, viewable here . But as the years roll by, not only do the creatives behind these releases get better and better at what they do, but the quality of manufacturing just keeps on making bigger and bolder leaps. 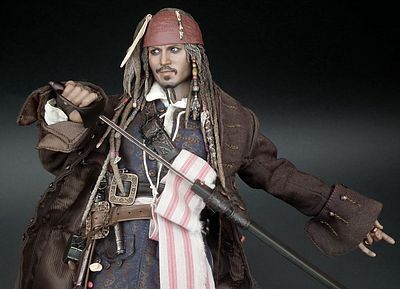 So if you already have what you consider to be a great representation of Mr Sparrow on your shelf, is there really any need to own this one? When you buy a DX figure you just know you are getting a great piece of graphic design on the box, and top quality materials will be used to make sure the whole experience of un-boxing will be as memorable as possible. 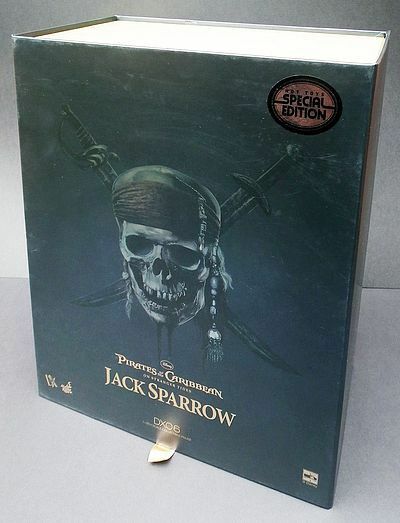 The overall colour is a dark metallic charcoal with the POTC skull and crossbones on the front over the movie logotype, and because this is the special edition version we have a silver foil sticker in the top right hand corner that has quite a 70’s Star Wars vibe. 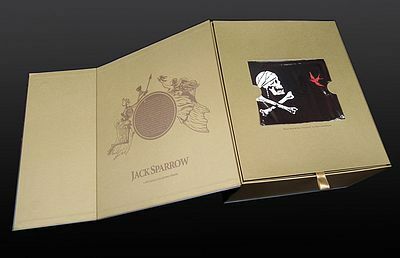 Then as per usual we get a magnetic side clasp that unwinds to the left, this inner packaging is a patterned gold colour with a brief character bio on the left and a scaled 1/6th Sparrow flag ‘Jolly Roger’ with a tattered edge. Each DX has come with a groovy gimmick on the first layer, and it’s nice to see it continued here. The next layer shows the fully dressed figure and the alternate smiling face through die-cut windows in the card overlay. Lift the card out and you are welcomed to his embarrassment of riches all nestled in cut foam. The next layer below holds the ships wheel, ornate nameplate and the regular stand. Then delve another level deeper and you’ll find the base to stand the wheel on with a small instruction booklet and a post to put the Sparrow flag on. Once again Dixon Chan and Monster Jr have come up with the goods, a great piece of packaging for a truly amazing figure! That first sculpt that Ko Jun worked on as a limited ‘independent’ project has become a thing of 1/6th legend, changing hands for big sums of moolah. However, I’m sure that even the sculptor himself would admit that these new versions are a huge leap forward in showcasing his talents. Though it is worthy of note that his first attempt had real hair, the longevity of sculpted dreadlocks on this new one does make me feel a little more reassured for its long term future. Ko Juns work on sculpted hair has always been super detailed, and here he gets a chance to really show off. There are numerous individually sculpted braids with various trinkets and beads woven into them, with the infamous reindeer shin bone now taking a more prominent position to the right of his sculpted bandana (no doubt to bring him more powerful juju). So yeah, the hair is exceptionally well done, but what we really wanna know is… how good is the face? We all knew what one face was going to look like, as it was unveiled early on with the official proto-type spec and pics. There was however a second smiling expression to be included and early on some pics did circulate of this portrait. They were however quickly suppressed… it would seem someone from Mr Depp’s camp or maybe the Disney stable wasn’t quite happy with it. And so after some tweaking here at last is the second face reveal! It’s not so much a full smile, but more of a mischievous smirk. Both the portraits are however absolutely note perfect. Normally when we get a release with two facial sculpts there is invariably one that is pure awesome and ‘the other one’. Here however we get two that have set another impressive benchmark. Ko Jun’s work on the skin texturing is sublime, as is the gentle detailing on the facial hair (and yes he has remembered the small burnt/scarred patch in the left hand side of the chin) and he’s also tricked in the X shaped scar on the left cheek and the tiny scars in the left eyebrow. Both heads have the PERS feature, and though firm, I found both worked very well with gentle manipulation. To access the PERS the whole of the hair section lifts off (its held by a magnet). You can then swap over heads by popping the ball joint in or out of the neck post. It’s pretty easy to swap over and no seams or division lines are visible at all. 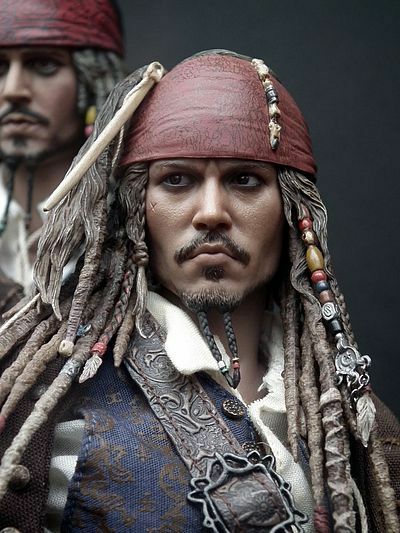 I really loved the first version Yulli did for Hot Toys, for the time it came out it was pretty amazing. But now, standing next to the DX version, it just looks like a rather good ‘look-alike’ Cosplayer. I can’t praise these two new sculpts up enough, just phenomenal work from master Ko Jun. As you would expect all the extra hands are sculpted to the highest of standards, with all the fine detail on his jewellery, leather and other adornments represented to perfection. And of course, all importantly they can interact and hold his various accessories well. There is also some superfine work carried out on the sculpting and tooling for the accessories, but I shall cover that later in the relevant section. OK, I’m short on time, so what actually needs to be said? Well of course this is again the work of Mr JC Hong, applying his magic touch to two amazing sculpts by the master sculptor Ko Jun for Hot Toys premiere showcase figure DX series… so what do you expect? Yeah… it is 100% faultless. 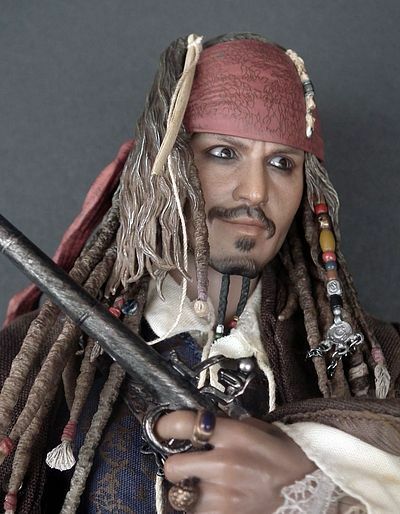 The dirty flesh tones and fine mottling help to make him look very real, then the beard, moustache and soul-patch are all delicately flicked in with soft realistic feathering at the edges. His top and bottom eyelids are painted in to mimic the smudged kohl he uses to give extra definition to his eyes, and then the eyes themselves are (as is always the case with PERS figures) small glass replicas. This means the eyeballs themselves have a spooky lifelike translucent quality. And the difference in opaqueness between the iris and the white is amazingly convincing at this scale, meaning they catch the light with an uncanny realism. The various hands with their rings and leather bindings also get a detailed application so as to highlight all the great detail in the sculpts, as do the various accessories. The True-Type has under gone a lot of tweaks and modifications over the years, sometimes slight and often big. But one thing you can guarantee is that each character that Hot Toys decides to do will get the attention it deserves to replicate it as closely as possible. And if that means a new body, then it will bloody well get a new body. However, because Jack is wearing a multi-layered outfit he is able to use a classic slim TT, and it suits the character well. It has a moulded neck, so there is no articulation at the base, but the ball joint at the top gives a good range of tilt and turn. The one thing I will say though is that I never plan to fully disrobe this figure or see Jack naked. Well because the outfit is so beautifully put onto the figure, that all it took was a little light futzing to get him just how I wanted, and I plan on keeping it this way! And even though I’m never one to underplay articulation, it is after all one of the most important categories to me (never been a big statue enthusiast), there are really just a few key poses I was interested in for this release, and he is more than capable of striking all of them… in fact he’s pretty nimble all round, and those soft boots make the ankles much more poseable this time around too. The scale is also more in keeping with true 1/6th now as well, if you check out the comp shot with the old Jack. 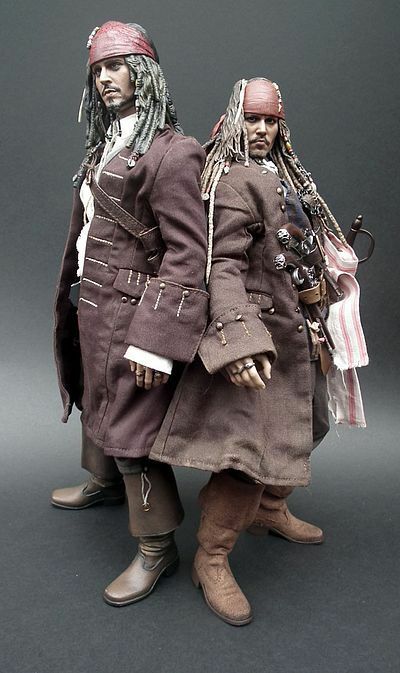 Depp is 5’9” where as the old one looked like he would be 6’ 4”… but I’ll let you do the maths if it’s a biggie for you. 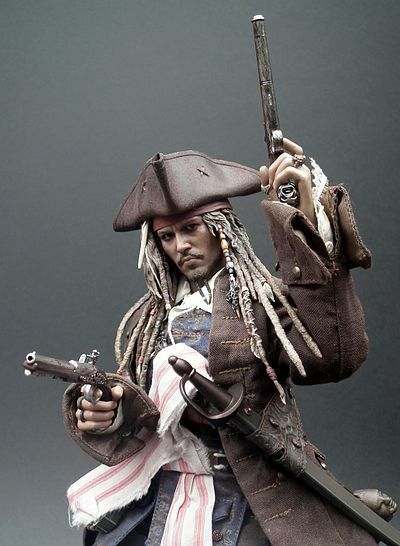 It was four years ago that I was knocked out by the first Captain Jack, not only because the tailoring and cut of his garments was so strong, but also because even though his outfit was multi layered it still managed to look convincing and hung with a realistic weight. But we all know that four years is a long time in the fast moving world of 1/6th tailoring, so once again we have another set of amazing improvements. 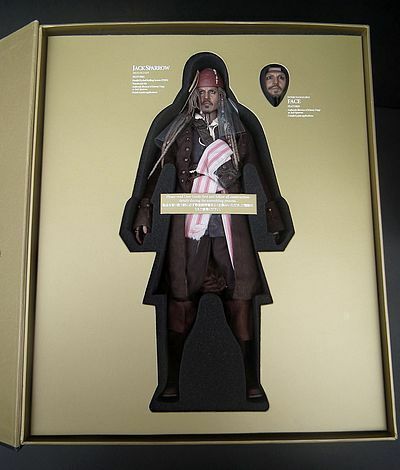 The original Jack Sparrow outfit was tailored by the Harue Creative team, of which Hai Lim was a member, and he’s back again in control of this outfit, this time its his baby alone (well, according to the credits in the instruction book). There are small details I shall try and pick up on all over the outfit, but it has to be said that every single piece of clothing from the original has been vastly improved upon here and for me the biggest and coolest improvement is in the boots. Gone are the rigid plastic moulded boots (with zero articulation), replaced here with soft, moveable and all importantly poseable suede-effect ones that are welted to a rigid sole. The trousers are very similar but the small adjustable buckles at the bottom hem are more accurate as are the details on the two leather belts and buckles. The waistcoat now has the ‘printed’ brocade detailing on the front sections and the pinstripe lines down the back, plus the tiny buttons are accurate as well now, instead of generic little studs. Another small cool detail is that you need to lift the sash over the bandolier when removing the coat. At first I thought I had pulled open a stitch that held them together, but then realise they had put a small magnetic clasp here to make this job easier. It’s only a miniscule detail, but so well though through. It makes life so much easier when swapping over his two looks. The linen shirt is a baggy fit with a cord tie at the collar and huge billowing pleated sleeves. The coat is a similar colour to before, but the new version has a coarser weave making it look more linen like. It also utilises tiny ornate buttons similar to those used on the waistcoat and is fully lined. It has pleats down the back, working pockets and a fine wire running through the hem to aid in posing. Lastly we get the new hat. Where as the old one was moulded plastic, this is made from a stiff die-cut leather-like material that appears to have been heat formed over a mould, then folded, glued and stitched into shape. This means it has much more natural ‘give’ in it and can be pushed down firmly onto the head in different positions. I discovered this was even easier to position after I had taken the photos… but speed was everything here, and Jack does tend to wear it quite high anyway. Everything is then given a weathering treatment and dirtied up to give it that classic Jack Sparrow ‘lived in look’ and its applied very convincingly… you can almost smell it! The other guarantee from a DX is usually a fantastic array of accessories (OK Michael Jackson broke the rule) often including a great diorama base like with the Bruce Lee figure and indeed the Indiana Jones that Mike and Guy covered just last week. And as impressed as I was by the temple environment Indy had, the ships wheel from Jacks infamous vessel The Black Pearl makes for an even more useful display item… well, in my humble opinion anyway! 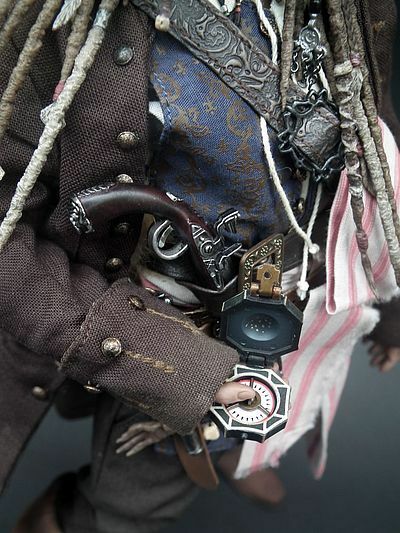 That’s a nice set of extras in any language, and all the various little trinkets and talismans that he likes to adorn his person with, do add up to making Jack look ultra detailed, and some of the fine observations on his brace of pistols is stunning to behold. 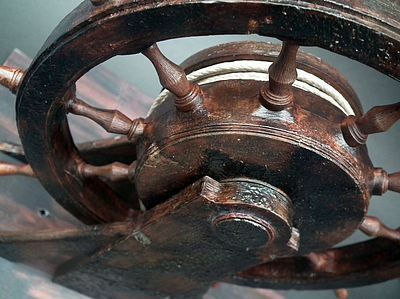 However, the real biggie here is that fantastic ships wheel; you can practically smell the sea air and barnacles when you look at it. It’s a big piece of kit with the main wheel coming up to the base of Jacks neck and the grab posts to his eye level. 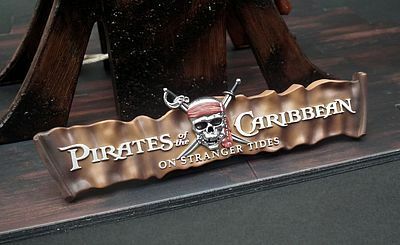 The texturing on the details and subsequent paint finish really do bring it to life, looking like it’s been on fire, put out and then been rescued from Davy Jones’ locker… as indeed it has! The wheel can turn and the rope that is bound around the hub has two ends that fit through the base plate (supposedly to operate the rudder mechanism) and an ornate POTC logo that attaches to the front of the base with magnets. 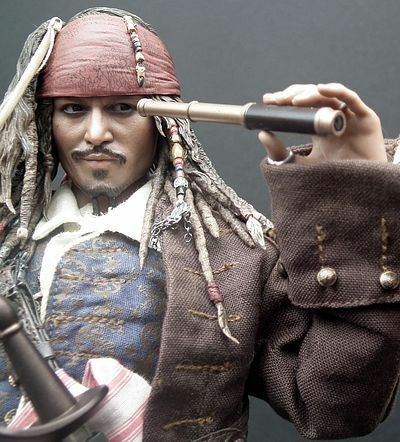 My other favourite piece is the exclusive funky, wonky long telescope that Jack used; I certainly won’t be posing my figure looking through it, after all, who’d wanna cover that face? But it makes a cute and eccentric prop to just hold nonchalantly while standing by the wheel, it doesn’t collapse in on itself (which I secretly hoped it would) but the detailing is solid and it has a large glossy lens at the business end. 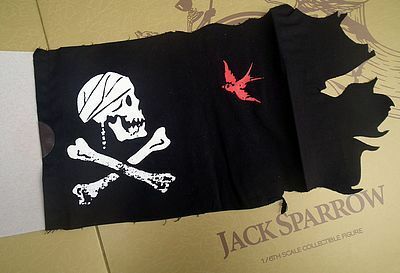 I also noticed there was a black pole packaged with the base, I think this is to use with the Sparrow flag should you choose to display it. His trusty sword (which HT describes as a sabre, but I’d call a cutlass) has also had a complete makeover. The new one is a good bit longer and also made of solid metal. Another small detail, but one that makes the world of difference when collecting high-end stuff, and certainly adds to the value! His brace of pistols don’t have any moving parts, but the detail is well observed and though not a true matching pair they do share the same grotesque gargoyle faces at the base of the pommels. 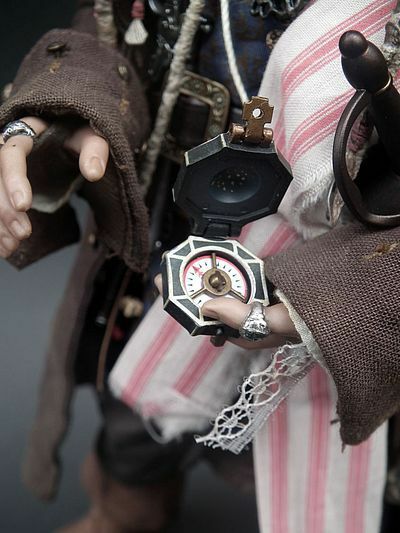 His infamous compass traded to him by Tia Dalma does seem to be a straight re-use, but as the previous one was so well made and detailed it’s of little consequence. 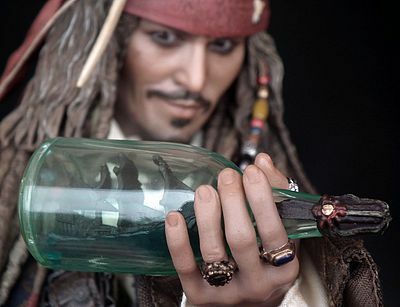 The same can be said of his rum bottle, but ‘The Black Pearl in a bottle’ is all new. It has some nicely carried out details on the stopper and the tiny replica of the ship inside is another cool addition to his collection of curios. By lifting the left hand side of his coat you’ll also find the small fur animal pelt attached to his belts. On the previous figure this was sculpted but has now been made from a small patch of actual fun-fur which again adds to the figures realism. 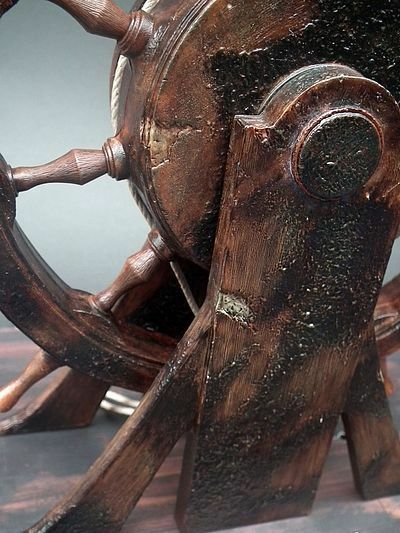 So, a great selection, and that extra head and the uber detailed ships wheel make this category a total home run. The cannibal king version was on show in my forever changing display for over two years before he got moved on to make way for new blood. He was a great display piece that often drew comment and enthusiasm, even from … in fact pretty much exclusively from non-collectors (I actually know very few onesixers in the ‘real’ world). So for me this is his rightful successor! At the various big conventions and shows this year it was eluded to that a second version of cannibal Jack might be in the works. 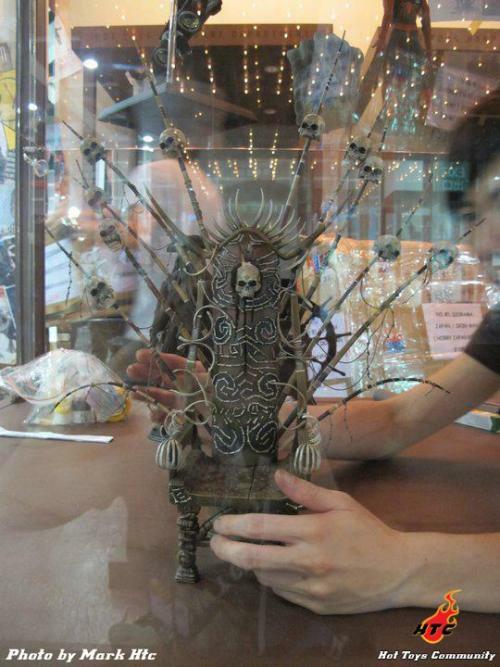 As there is a new 1/6th throne in the works, you can see the actual object displayed here and the mini-teaser poster from Hot Toys here so maybe it’ll be a another DX. 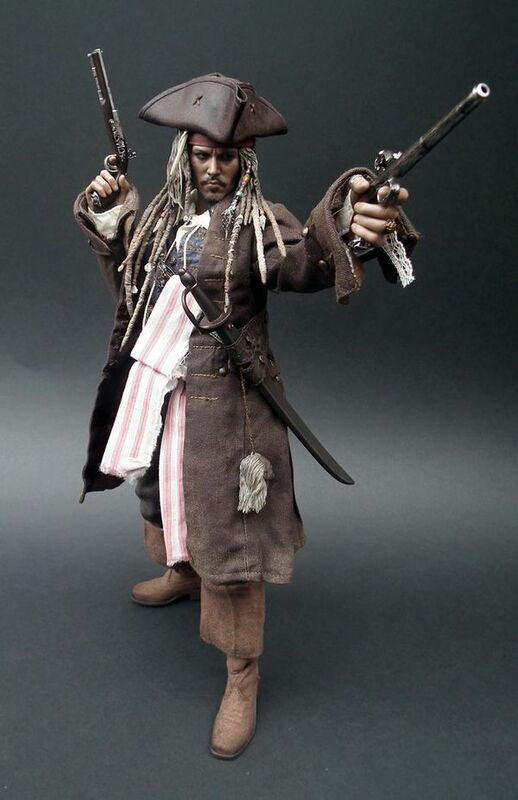 If ever a figure was made for the PERS feature it is Captain Jack Sparrow. You can inject so much more character into your poses with a simple eye movement, and the fact this feature is now easier and sturdier to use is even more of a bonus. 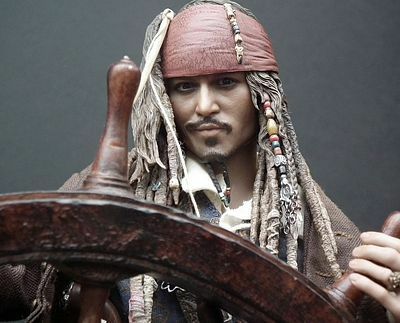 Of course it should not to be considered a child’s plaything… but as a display piece for any movie fan or 1/6th aficionado it is just the coolest. And the fact that the sculpt is the best version on the market at any scale makes the price tag seem a whole lot more reasonable. 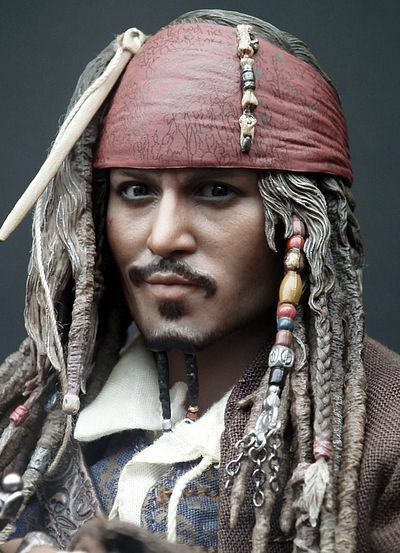 I mean, why pay over two grand for a � scale figure that looks likes Depp’s dead chubby second cousin twice removed when you could have this for a fraction of the price. Get it while you can! The RRP is $239… ouch… that’s just gotta sting. I was lucky enough to score this as a preview figure so I’m just imagining the pain, and yeah it does leave a dull ache and the possibility of a lengthy explanation to a loved one when the credit card bill arrives. However, it is a thing of extremely rare beauty, and I think pretty much all of those that have made the decision to jump on this will have had plenty of time to come to terms with their purchase and indeed save up for it, meaning buyers remorse will hopefully be banished from you feverish mind. 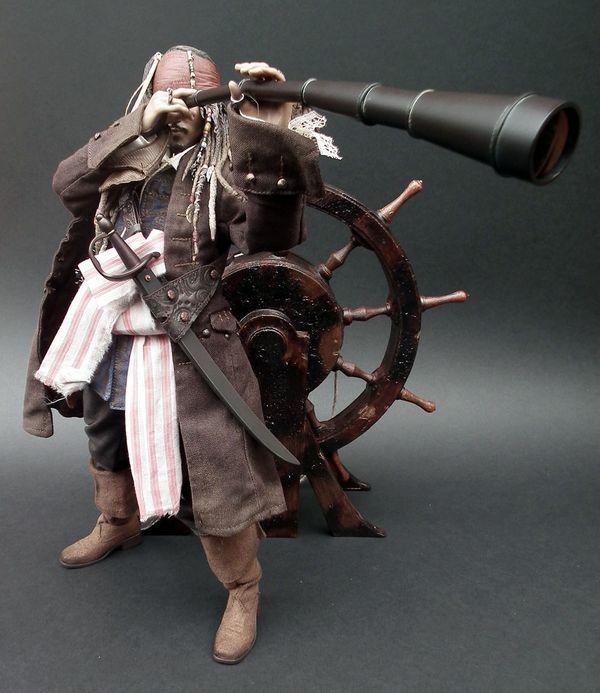 I did consider a mere three stars in this category, but those stunning sculpts, the amazing outfit (just lurving those boots to pieces) and the very cool ships wheel accessory end up making this look like a reasonably solid investment. So, its obviously not cheap, but the best things in life seldom are, and this is almost certainly gonna be your favourite figure once you open it up… and that speaks volumes when the competition is as tough as it is these days! Because of all the cloak and dagger intrigue surrounding the ‘early release’ of this figure for me to review, I got the feeling it was something that Hot Toys were very proud of. Something indeed that they felt needed a slightly bigger fan-fare to mark its release. And having it in my hands now, I can totally see why. This is pretty much the pinnacle of what can be delivered at this scale, as of early November 2011… of course, that doesn’t mean that by November 2012 things wont have taken another quantum leap… but right now this is IT! The high price does just keep this short of the full score, but only just. And as this is a full $10 less than Indy… perhaps I should have considered a full score… but then I remembered… $239.99 and I just couldn’t! Well, I hope that is enough to give you a flavour of this figure, and I hope it is in your hands before too long. I would have liked another day or two to really get to grips with him, but I can still say that without a doubt this is one of those rare figures that is just so iconic it deserves a place in the collection of every true 1/6th enthusiast, savvy! 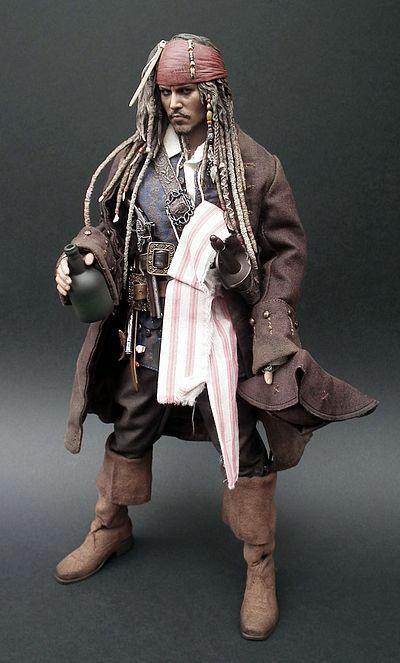 And I also have to say I never thought I’d actually own a Ko Jun sculpted Jack Sparrow… did you? 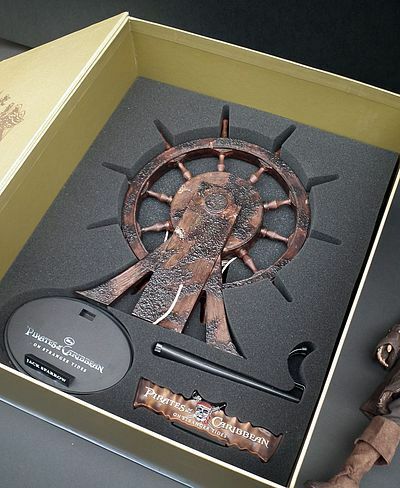 Both versions (including the exclusive with the long telescope and the regular without) are still available from the Sideshow website here on pre-order for the full RRP of $239.99. 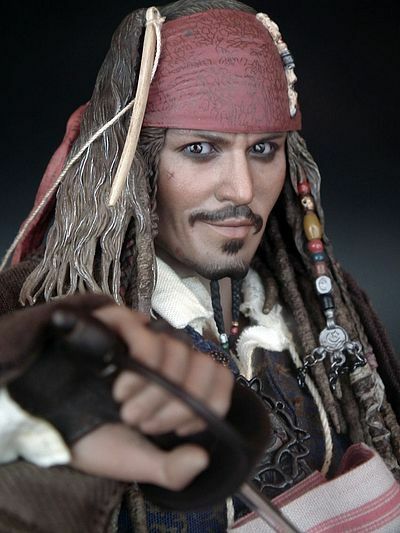 Alternatively you might prefer to gamble with some real Pirates over on eBay where pre-order prices are between $220 and $270, but keep an eye on those shipping prices me’hearties, or it’ll be rum deal ya git, arrrrrr! Did you enjoy the review? Plus 1 it!